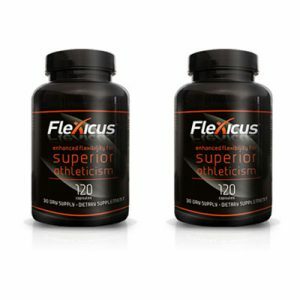 Flexicus 2 Month Supply - Flexcin International, Inc.
Flexicus™ contains CM8® (Cetyl Myristoleate) and Hydrolyzed Collagen Type II. Clinical studies have shown these all-natural ingredients promote optimal joint health, improve mobility & flexibility and nourish cartilage. Flexicus™ has been specifically formulated to support an enhanced range of motion and joint strength to help maximize athletic performance. CM8® (Cetyl Myristoleate), Hydrolyzed Collagen Type II, Methyl Sulfonyl Methane (MSM), Glucosamine Sulfate K, Peppermint Leaves Powder, Bromelain, Protease, Amylase, Lipase, Invertase, Cellulase, Bororganic Chelate. Other Ingredients: Maltodextrin, Magnesium Stearate and Gelatin. Contains NO: Gluten, sugar, dairy products, wheat, artificial color, artificial color, artificial flavoring, preservatives, yeast. Take one serving of 4 capsules DAILY with a glass of water and/or meal OR 2 capsules in the morning and 2 capsules in the evening. *****Persons with severe joint conditions may increase the dosage to 1 ½ servings (6 capsules) daily for the first 2 weeks or until joint condition improves then resume back to the regular serving size of 4 capsules a day.